The high-profile Irish republican Marian McGlinchey, formerly Price, has been released from custody after more than two years. The convicted IRA bomber had been in custody since May 2011, when the former Northern Ireland Secretary, Owen Paterson, revoked her licence. She was moved from Hydebank Prison to a hospital on medical advice last June. She is now at home with her family. She was previously convicted for her part in the Old Bailey bomb in 1973. When she was first sent back to prison, Mr Paterson said he made the decision to revoke her licence because the threat she posed had "significantly increased". In a statement issued by her family on Thursday they said they were happy to confirm she had been released. "This comes after being held for over two years in isolation on the basis of Closed Material Proceedings. Media captionThe Parole Commissioners determination was based on her "current circumstances". "We would like to thank all those groups and individuals who worked tirelessly to campaign for Marian's release. "Although she is now at home she is still very ill and we would ask that the media respects our privacy at this time." 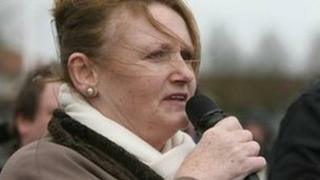 Marian McGlinchey has been a leading member of the political wing of the dissident republican group, the Real IRA. She was arrested two years ago after she held the text of a speech for a masked man at a Real IRA rally in Londonderry, during which the man made threats against the security forces. She was later charged with having supplied a phone used during the murders of soldiers Mark Quinsey and Patrick Azimkar, who were shot dead outside Massereene Army base in County Antrim. Her deteriorating health led to her being transferred from prison to hospital last year. The charges against her - providing a mobile telephone for a terrorist purpose and aiding and abetting a meeting in support of an illegal organisation - still stand. She had been granted bail on those charges at the time but was taken back to jail due to Mr Paterson's decision to revoke her licence. Her recent imprisonment was controversial and many campaigned for her release. The decision to release her from custody on licence on Thursday was taken by the Parole Commissioners. In a statement, the Northern Ireland Office said the independent Parole Commissioners determination was based on her "current circumstances". It added that the decision reflected the fact that Mr Paterson's move to revoke her life licence in May 2011 was justified. "Information about the proceedings of the Parole Commissioners are not to be made public and the Northern Ireland Office therefore cannot comment further," the statement said. "Marian McGlinchey continues to face charges for two separate offences through the Northern Ireland courts." She was previously convicted along with her older sister, Dolours Price, and Sinn Fein MLA, Gerry Kelly, for their part in the IRA car bomb attack on London's Old Bailey courts in 1973. One man died and more than 200 people were injured in the bombing. Dolours Price died at her home in Dublin in January at the age of 62.